The Phoenician mask from Motya. What do you make of this face and its expression? Does it seem friendly or menacing, eerie, funny or just strange? It is certainly an intriguing sight, an example of a fairly rare type of artefact that is not yet fully understood, created by a major ancient civilisation that remains as mysterious as it is famous. 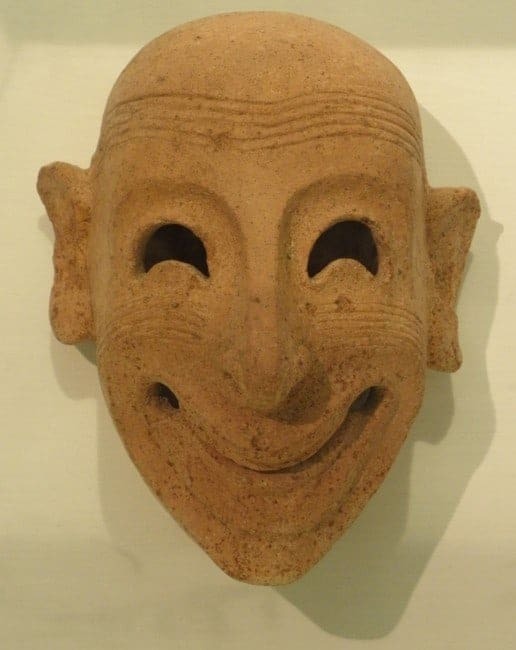 The object is a life-sized clay mask, probably from around 500 BC, discovered among the remains of the Phoenician (or Carthaginian) city of Motya, off Sicily. Off Sicily? Indeed: the ancient city occupies all of a small island now known as Mozia, set in the middle of a large gulf on the Sicilian west coast. Founded before 700 BC, probably by settlers that came from the Phoenician heartlands along the shores of modern Lebanon, Motya soon developed a close relationship with the rising star among Phoenician colonies, Carthage in what is now Tunisia. As Carthage was building an empire in the Central and Western Mediterranean and becoming a rival and threat first to the Greeks and later the Romans, Motya, in a favourable position for navigation and only 215km (135mi) to the northeast of Carthage, became a key strategic point and a thriving maritime trading centre. It lasted until 397 BC, when Dionysius I of Syracuse famously besieged and destroyed it, depriving the Carthaginians of an important base. As a Phoenician city that was never built over after its destruction, Motya is a uniquely fascinating and highly important archaeological site – we’ll return to it before long on this blog. Perhaps a little more familiar? 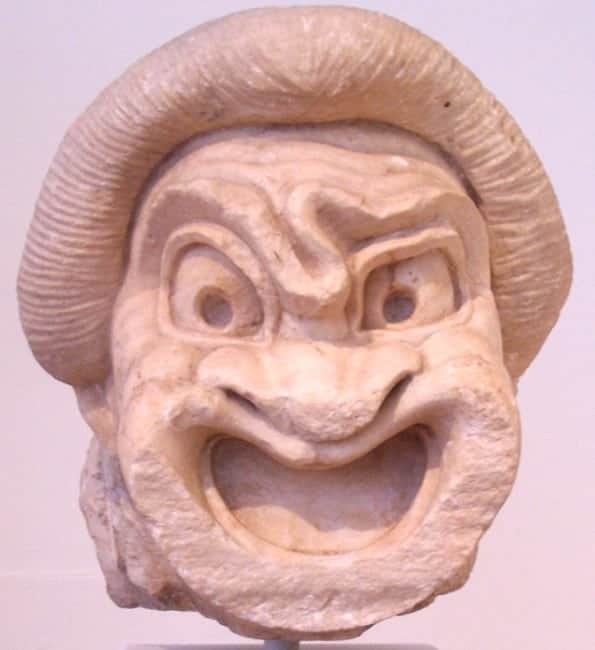 A marble copy of a Greek clay comedy mask in the National Museum at Athens. What about the mask, so? Whom might it depict and what purpose would it have served? We cannot answer either question with any precision. Such masks have been found – if only in small numbers – throughout the Phoenician world, e.g. in Lebanon, Carthage, Cyprus and indeed Sicily. Many were discovered in graves, but not our specimen from Motya. The Motya mask was found in a key spot, next to the island’s kothon or artificial harbour basin, where one of the city’s main temples or sanctuaries had stood throughout the life of the city, sacred most probably to the Carthaginians’ chief god, Baal-Hamon. After the 397 BC destruction, during which the temple had been razed to the ground, a pit was dug in its rubble and a number of significant objects deposited in it, presumably a respectful interment of sacred objects in a sacred place – including our mask. The mask ought therefore to be placed broadly in the realms of religion and ritual. 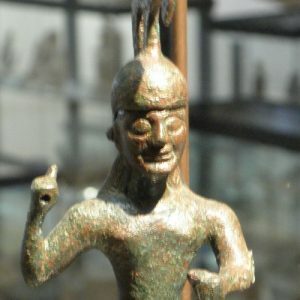 That is in itself hardly surprising: as masks allow humans to briefly impersonate another individual or entity, their use in ritual contexts is widespread across time and space, occurring in many cultures throughout history, from the cave paintings of distant prehistory to many religious festivals of the present. 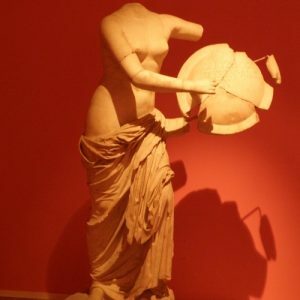 The most famous example from antiquity are the clay masks worn by actors in Greek tragedies and comedies, the performance of which usually took place as part of events honouring the god Dionysos. There is also ample reference to masks being worn as part of Roman funerary rites, depicting deceased ancestors or warding off evil spirits. 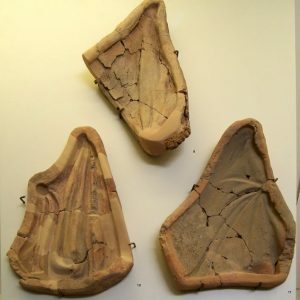 The closest parallels to the Phoenician masks, however, are a group of clay masks found in the sanctuary of Artemis Orthia at Sparta in the Peloponnese, mainly depicting old women. Whether the similarity is a coincidence or the result of some meaningful connection is not clear. 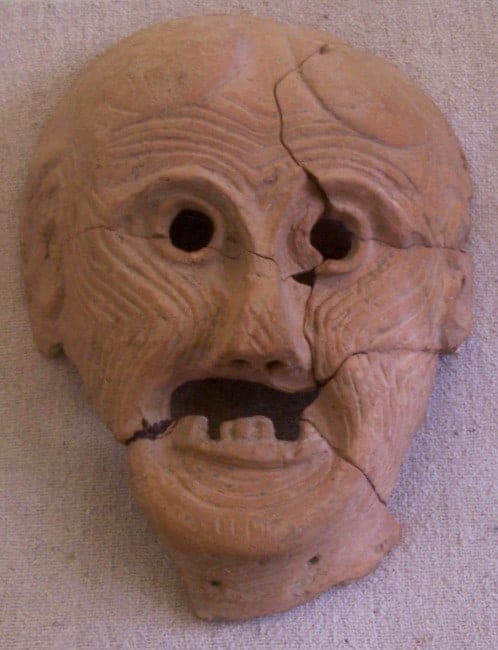 Definitely scary: Clay mask from the sanctuary of Artemis Orthia at Sparta (Greece). Unfortunately, our knowledge of Cathaginian/Phoenician religious practice is very limited, as that culture’s own written record has not survived, leaving us with accounts by their Greek and Roman enemies. Those reports tend to depict a dark, cruel and bloodthirsty cult, but are more likely to reflect an intend to slander rather than describing an actual reality. Be that as it may, they do not specifically focus on the role or use of clay masks in any case. Thus, we cannot interpret the Motya mask in more detail for the time being. Probably meant to be worn in some ritual or formal context, it might depict a human state of emotion, but could also represent a demon or other supernatural creature. With its exaggerated smile, crescent-shaped eyes and incised lines or wrinkles on cheeks and forehead – do they indicate old age or just a facial contortion? – it is a striking sight, an enigmatic grimace that invites us to read our own meanings into it (not unlike the Archaic smiles we discussed a while ago). You can see such Phoenician masks in a number of key museums worldwide, including the Louvre in Paris and the British Museum in London. But if you want to admire one in context, integrated into a visit to the site of its discovery and along with other objects found there, you should join us in visiting Motya on our Exploring Sicily tour, where it is one of the most unusual among many archaeological highlights.